Chris Davis can breathe a sigh of relief. 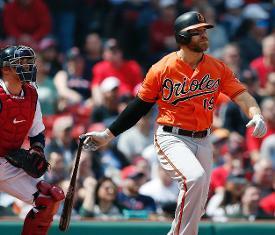 The Baltimore Orioles slugger singled with the bases loaded in the first inning against the Boston Red Sox on Saturday to end a record streak of 54 at-bats without a hit. Davis' hit, off Red Sox right-hander Rick Porcello, drove in two runs and even brought about cheers from the Fenway Park crowd. Many in Baltimore are likely also cheering, as several local restaurants and bars have previously announced deals correlating with the end of the skid. Davis had entered the contest hitless across his last 62 plate appearances. He lined out into the shift as a pinch hitter in Friday's 6-4 Orioles loss to extend the streak. Davis' last hit came Sept. 14 against the Chicago White Sox last season. He set a record for futility in 2018, hitting .168 in 522 plate appearances - the lowest qualified batting average for a season in major league history. Davis has four years remaining at $17 million annually on a seven-year, $161 million contract signed with Baltimore in 2016.